The technology may have a very futuristic feel to it, but in current implementations, it’s clear now that artificial intelligence (AI) and machine learning (ML) have very practical real-world applications that aren’t nearly as scary as some may fear. Companies want to use AI-based applications to improve their overall efficiency across a number of different areas. The hope is that AI-based tools can reduce some of the more tedious, repetitive tasks that can slow organizations down—or that some simply choose not to do because the tasks are so challenging to maintain. In addition, companies of various sizes and types believe that AI-based applications can speed up or help automate many of these tasks. Whether it’s automatically filtering spam and phishing attacks from email; analyzing files or other data as they’re opened, created, or passed along; or acting as a perimeter shield on networks and examining the packets that travel across them, the realistic benefits of many AI-based or AI-enhanced applications are proving to be attractive to nearly 1-in-5 US companies with at least 100 employees. For a number of companies, AI is also seen as a next-generation big data analysis tool, destined to deliver on the promise of big data that many companies disappointingly discovered wasn’t as easy to mine for insights as they were led to believe. The idea is that AI algorithms can take over some of the data grunt work necessary to uncover useful information and leverage larger amounts of raw data in more efficient ways. It’s still early days here, but it’s clear that many companies are eager to see these kinds of results. 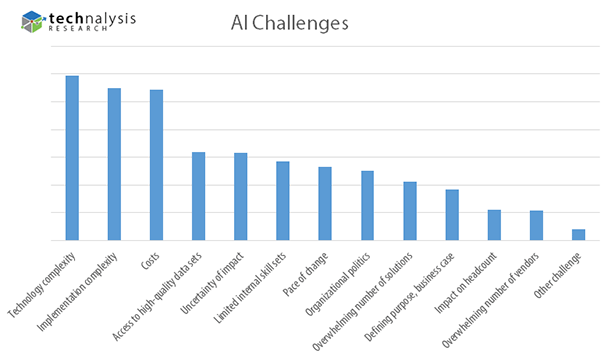 Some organizations are also hoping to generate cost savings from AI-based tools, but it’s clear that this is still a lesser priority for many organizations, particularly because of the costs that are often involved with AI-based applications and projects. The biggest challenges, however, had to do with complexity—both of the technology itself as well as the means to implement it. This isn’t terribly surprising because the level of real understanding about AI is still quite low. Despite the fact that AI and machine learning have been around in some form or other for decades, most people are just starting to learn about them. Plus, the hidden “black box”-type means by which many AI algorithms work makes it difficult for anyone but dedicated specialists to completely get their heads around the technology and understand how to make it do what you need (or want) it to.